Why do I need knock sensors? Morgans from the factory had the knock sensors removed so as to put the ECU into limp mode. The reason for this was so that the cars would pass certain emission tests. Once our ECU chips are fitted the knock sensors will obviously need fitting so that the ECU has all of its vital data. With our ECU chips fitted not only will your Morgan still pass emissions and USA smog tests but also you will have 30%+ power, driveability and efficency. What do knock sensors do? 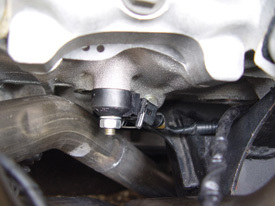 Knock sensors allow the engine to listen for pinking (pre detination of fuel). PInking occures in most cases if the igniiton timing is to advanced (the spark being sent to the spark plug too soon). The Sagem ECU runs with its ignition timing at the optimum point, just before pinking which is why it must have this vital piece of information. Where are they normally located? 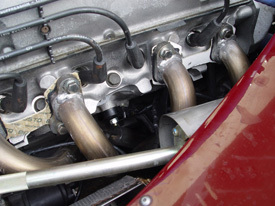 As you can see on the above two pictures (right close up and left showing the relation on the engine) the knock sensors are located on the side of the engine in the centre, one either side. From the factory the Morgan 4.0 litre did not have these so we supply with our knock sensors the mounting studs and nuts. The wiring was simply tucked back into the main loom by Morgan so the connector is still present but is hidden.